I’ve seen several Facebook posts about taking down holiday decorations and how bare everything looks. When I had a gallery it was my favorite time of year. Those that got money for Christmas would come buy new “things” because “the house just looked so bare”. Truth is, we can’t wait to get all the decor down but then we miss it. What a conundrum. I thought I might talk a bit about giving new life to your place now but also as seasons change. In Forward and Fabulous you saw our display case with the “Bucky Trees”. When I took the trees and lights away I decided not to put everything back in the case in order to give it a cleaner look. Pardon the shadows but you can see I kept most of the white items and accented with some black. The books I have are ones I want to keep but I don’t have to have them at my fingertips so I did white book covers. This way they offer dimension without clutter. You can see I like repetition and use it with photos as well as collectible porcelain. The holiday presentation was so dramatic it certainly was a shock to take it all away. I wanted the same simplistic design approach I used for the holidays so I stored several things until I get ready for another change. Let’s look at other display options to make your house lovely. 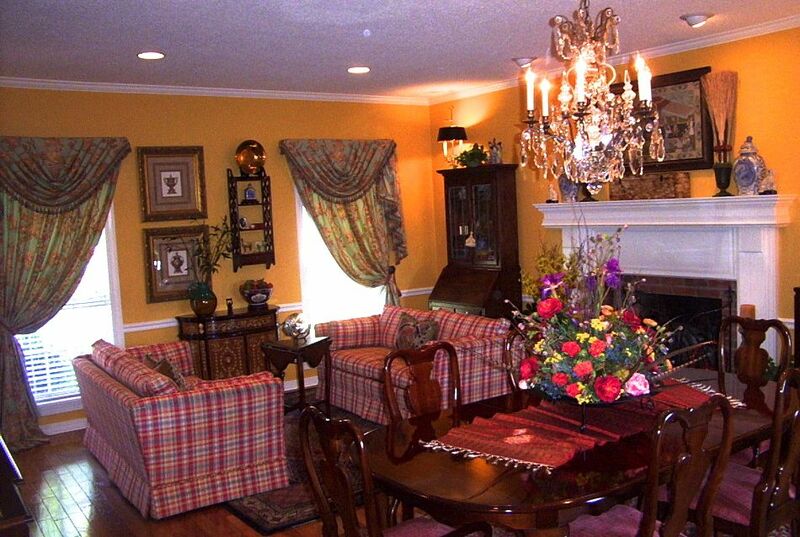 This is the living/dining room and the family room of the same home. 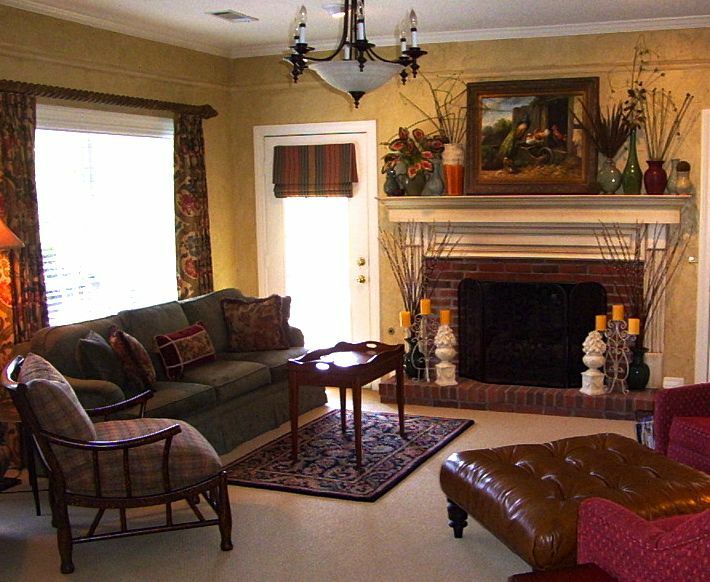 Take a look at the mantles. The living room mantle is symmetrical with matching blue willow lidded flask vases, a pair of Staffordshire dogs and matching floral designs on either side of a decorative box. Using this as a dual purpose room means several furniture pieces. Also, there’s patterned draperies and upholstery. Therefore, I kept the mantel simple. The florals for the holidays were a pair of fresh amaryllis. For spring it will change to wisps of forsythia. In the family room the homeowner had a collection of pottery. While it would be fine to display empty vessels it just feels bare after it’s been full of Christmas greenery and sparkle branches. Again, what you see can be used year round but can also be interspersed with seasonal stems as the year progresses. This home has display cabinets that have retractable doors. For a party I took the everyday items out of one cabinet and created a beverage station. 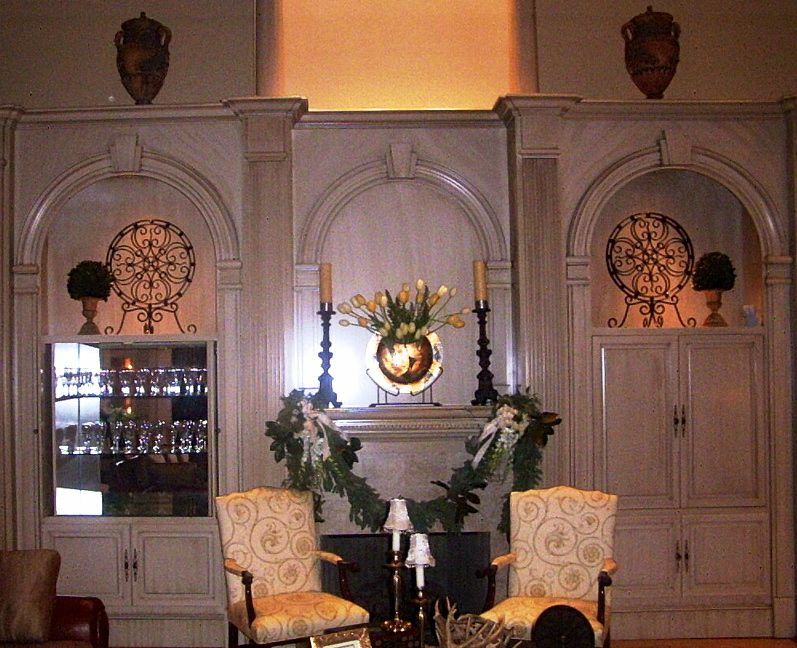 Looking at the overall design of this wall you see that it’s quite dramatic from the scale and millwork alone. Thus, the accessories are symmetrical and add to the composition simply through scale and texture. Yet, they are dramatic enough that when the garlands and fresh flowers go away the wall doesn’t feel bare. 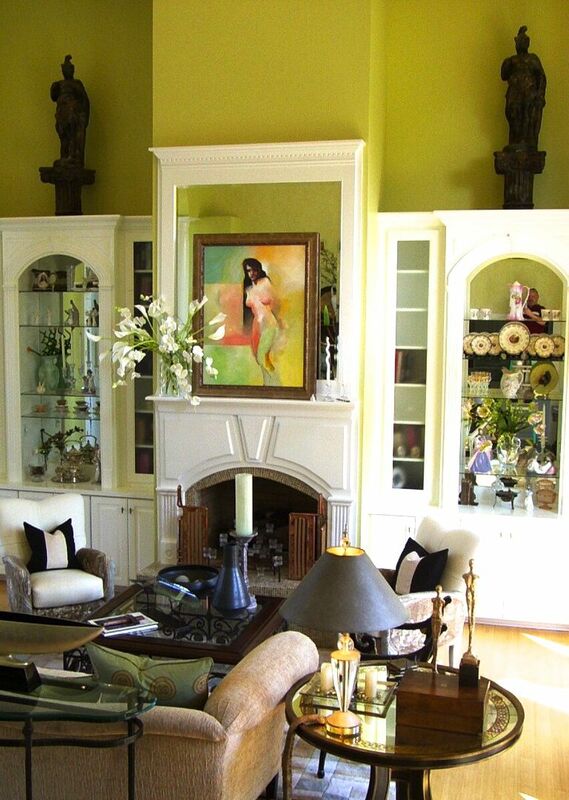 Here we have a living area with a display cabinet and a mantel. For the holidays the display shelves are full of nutcrackers and the mantel adorned with lighted garlands and beautiful topiaries. For everyday the display cabinets holds family heirlooms, collectibles and pottery. What I want to point out is the mantel. The art and mirror doesn’t need competition. Of course, all rules go out the window at Christmas. However, year round the Waterford vase is filled with florals that offer texture only. The white of the calla lilies and phalaenopsis orchids do just that. For spring it could be filled with jonquils and oncidium orchids. The monochromatic floral contribution serves to support the art and could be done with any color that’s on the canvas. 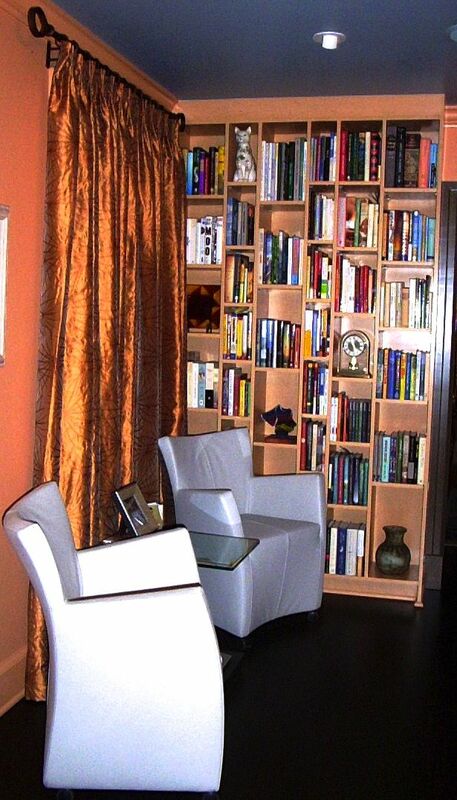 Finally, I wanted you to see a contemporary design and my favorite bookcases I’ve ever done. 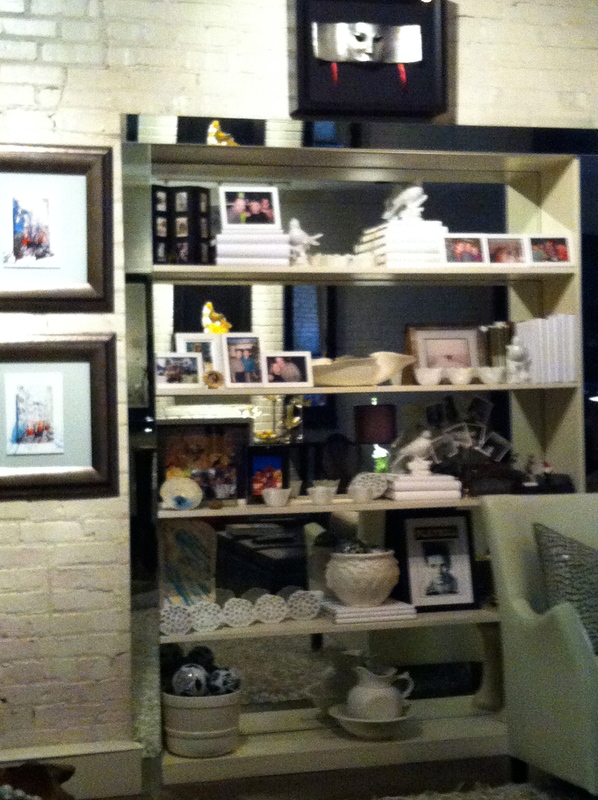 The client found a picture of a similar freestanding case and we created a built-in version. The options for this kind of unit are endless. For the holidays the collectibles can come out and santas, snowmen, family heirlooms and pictures go in. Since I took this picture the client has acquired more framed art and now has a couple of framed art pieces strategically hung on the face of the case. For parties you can see places where small vases of flowers can tuck in. Also, votives with battery operated lights can rest beside and call attention to beautiful works of art. The possibilities are simply fabulous. I hope some of these thoughts will help make your house lovely and when your friends come calling that a good time is had by all. Looking oh so good! I love your style, keep the blog coming!